Truth: I have a hard time writing cookie posts without getting up to eat at least one. two. For this reason I usually like to post salads and other lighter foods on Mondays, but I’m switching things up today because sometimes you just need a #cookiemonday (or in this case a coconut macaroon Monday) and that’s ok. These coconut macaroons are more cookie-like than most. 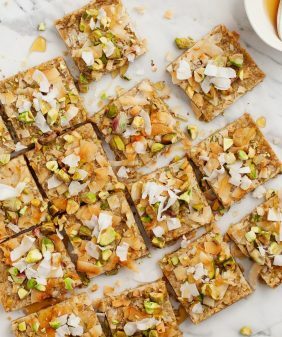 They’re made with (of course) lots of shredded coconut, but they also have ground almonds, cinnamon, maple syrup, vanilla, and coconut butter. These are pretty substantial cookies which make them a terrific afternoon snack. This coconut macaroon recipe is from Angela Liddon’s new book, Oh She Glows Every Day. I’m sure you all have it by now, right? If you don’t, and you’re vegan (and even if you’re not), you’re going to love it. 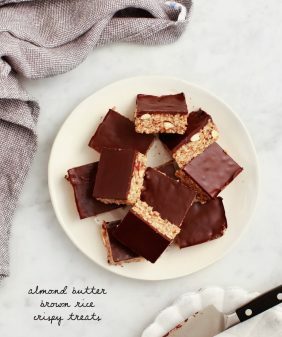 It’s packed with SO MANY yummy vegan recipes and some especially show-stopping desserts. There’s even an entire chapter devoted to vegan cookies because Angela is a girl after my own heart. Usually this is the part of the post where I show you a recipe that I’m going to make next… but this time I’m showing you this awesome chocolate tart because I made it, and it’s awesome. A few leftover slices are in my freezer waiting for a special occasion where I haven’t already eaten 2 coconut macaroons after lunch. Get the book! 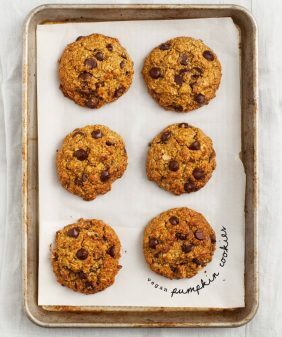 Or, for more vegan treat ideas, try this banana bread, these banana muffins, or these chocolate chip cookies! 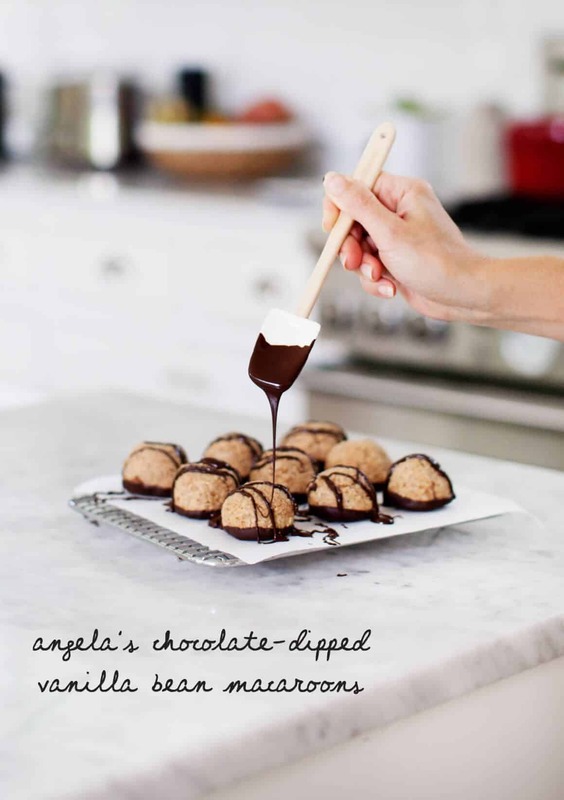 Vegan and gluten-free coconut macaroons recipe from Oh She Glows Every Day by Angela Liddon. Great for the holidays! Preheat the oven to 275°F. Line a baking sheet with parchment paper. Line a large plate with parchment paper. In a large bowl, sitr together the almond meal, shredded coconut, salt, cinnamon, maple syrup, melted coconut butter, vanilla extract, and vanilla bean seeds until throughly combined. The dough will be thick and sticky. With a 2-tablespoon retractable cookie scoop, scoop a ball of dough and pack it in so that the top is flat. (note: I didn't have the right scoop so shaped these with my hands). Release the dough onto the prepared baking sheet. Repeat with the rest of the dough, setting the macaroons about 2 inches apart on the baking sheet. Let cool on the baking sheet for 10 minutes, then carefully transfer to a cooling rack to cool completely. Dip the flat base of each cooled macaroon into the chocolate and twirl the macaroon until the base is coated in chocolate. 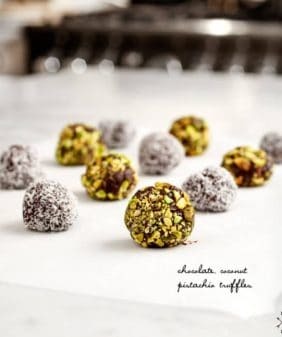 As you dip them, place each macaroon onto the parchment paper-lined plate, upside down, so the chocolate coating is facing upward. Freeze the macaroons for 10 to 15 minutes, or until the chocolate has hardened. Flip each macaroon chocolate-side down and drizzle the remaining chocolate on top (reheat the chocolate until liquid, if necessary). Freeze for 5 to 10 minutes, until the chocolate drizzle is firm. Store leftover macaroons in an airtight container in the fridge for up to 1 week. Freeze for up to 1 month. 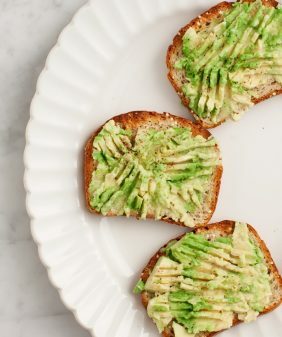 *I grind them in my Vitamix for a little less than 1 minute. **Angela's instructions advise not to skip this because they won't hold together with coconut oil. She has a recipe for homemade coconut butter in the book, but I used the Artisana brand coconut butter and it was great. So glad it’s not just me that over indulges on cookies while writing up their post. Thank you for this recipe. My husband loves coconut and chocolate – We do not have any vanilla bean momentarily. 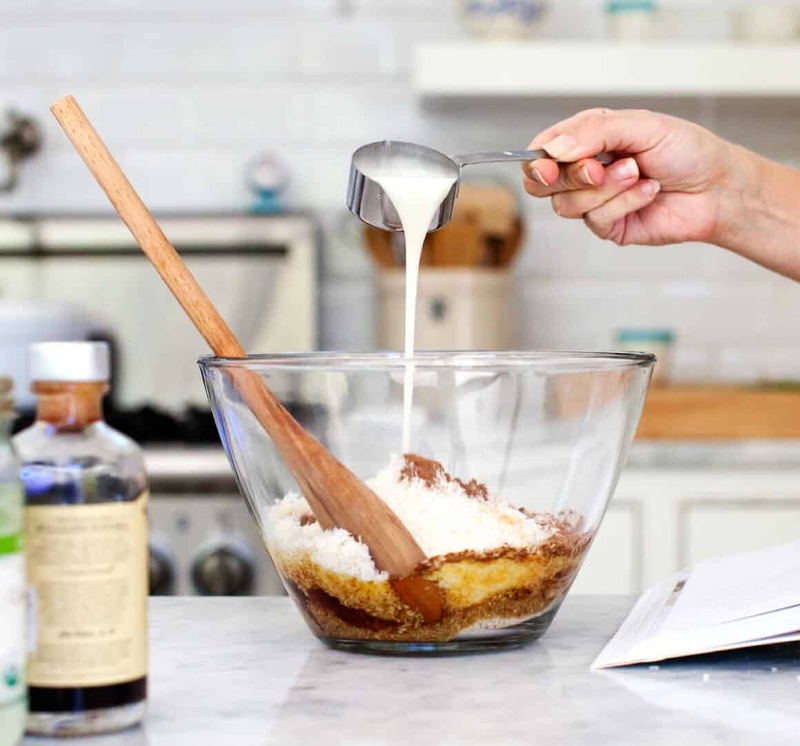 How much vanilla extract did you use? I don’t want to mess up the recipe by adding too much or too little extract. Thank you! I used a total of 2 teaspoons vanilla extract. Hope you like them! These look wonderful! I buy some that have similar ingredients & they cost an arm & a leg so I’d love to make my own. 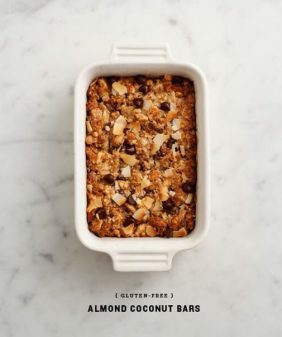 I’m assuming I can use almond meal instead grinding raw almonds – does it comes out to a bit less than 1 cup once ground? Thank you! Hi Meg – I think it should work. I would go with around 3/4 cup. I have so many ingredients for my gluten free diet that I hesitate to buy coconut butter, something that I am not likely to use very much, if at all. Do you think there might be something that I can substitute it with? I am not vegan, but just gluten free. The recipe sounds delicious, and I want to make it. Thank you! Angela makes her own coconut butter, this is what she does (I haven’t tried it): Blend 3-4 cups of medium-shredded coconut in a heavy duty food processor until liquid, about 5-8 minutes. Hope that helps! Ha! Yes sometimes we do need a cookie Monday. And I think the melted chocolate step is essential. Love the combination of coconut and almond flour. These would be a great additional to a holiday cookie tray. These make me so happy! I chose to keep the vanilla bean scrapings, (some beautiful beans I had leftover from my extract batch, I had gotten at slofoodgroup.com) and really loved how it turned out. The vanilla and the raw almonds are a wonderful combo- thank you! Hi Shelly, I’m so glad you liked them! Can I use almond flour rather than almond meal?